The storyline that pits Clark Kent against Bruce Wayne in Batman v Superman isn’t very good, barely held together by the flimsiest of threads. But this grudge match/team-up has already happened a lot in comics, and most times it’s been more compelling than Zack Snyder’s mess of a movie. Superman and Batman have been around for more than 75 years, and, for the first big chunk of their publishing history, they were best buds. Clark would swing by and visit the Batcave, or an investigation would bring Batman to Metropolis, wacky hijinx would ensue and they’d resolve the plot without a hint of rivalry. The two crimefighters would clash from time to time, though, and those fights often highlighted key differences between them. As DC Comics has rebooted and reset its fictional universe over the decades, Bruce and Clark’s relationship has gotten more tense and volatile. The stories below showcase the moments when Bats and Supes have come to blows, traded harsh words or entered into uneasy partnerships with each other. In the original iteration of the DC Universe that started with Superman’s first appearance in 1938, the Last Son of Krypton and the Caped Crusader had a relationship that was largely friction-free for years and years. They shared top billing in the long-running title World’s Finest, which had them teaming up almost every issue. However, in the mid-’80s, Batman left the Justice League and formed his own super-team after an argument centered on breaking the law in the service of seeking justice. This sequence from 1984’s World’s Finest #247 shows how the characters interacted with each other after that rift. It’s more a verbal fight than anything, but it gets at what annoyed them about each other. Everything changed for the DC Universe in 1986. A massive crossover event called Crisis on Infinite Earths resulted in a completely rebooted timeline, with updated takes on the origins and relationships of DC’s stable of heroes. Superman’s modern-day origin story rolled out in the Man of Steel miniseries, which included a new story showing a first meeting with Batman. In this issue, Bruce thwarts Clark’s efforts to bring him in by saying that a bomb will explode and kill an innocent person if the Kryptonian so much as touches him. There’s an end-of-story twist that makes this gambit a little less cold-blooded, but the moment drives home the idea that the post-Crisis versions of these characters wouldn’t be chums any time soon. Batman v Superman draws heavily on Frank Miller’s best known Bat-opus, pulling lines and scenes from the seminal 1986 alt-universe story. The two icons have fought a bunch of times after Dark Knight Returns, but this tussle is still the biggest, nastiest brawl they’ve ever had. Most of Batman’s major villains showed up in this extended 2002-2003 storyline, which started in Batman #612 and featured a mysterious foe’s elaborate scheme to take down the Dark Knight. Poison Ivy’s mental manipulation powers figure prominently in the villainous plan, and another memorable black-vs-blue battle sparks off when she takes control of Superman and commands him to kill Batman. Being a normal, non-powered human being is what separates Batman from most of his colleagues in the Justice League. This classic Justice League arc from 2000 by Mark Waid, Howard Porter and Steve Scott revolves around the paranoid but pragmatic strategies that Bruce concocted to take out all of the other heavy hitters in DC’s A-list super-team. He devised these countermeasures in case the other Leaguers ever fell under the sway of mind control or other ploys that would make them lose their wits. Those Bat-plans wound up in the wrong hands and everyone was mad at Batman for a good long while. On the heels of the successful 1990s Batman animated series, Superman got his own cartoon spotlight show as well. A three-episode arc from 1997 threw the two together to thwart an alliance between Lex Luthor and the Joker, complicating things by having Lois fall in love with Bruce. These sequences show the deft touch that earned creators Paul Dini, Bruce Timm and their cohorts so much love while these shows were on the air. Spearheaded by Mark Waid and Alex Ross, Kingdom Come is set in a near future where Clark Kent retreats from superhero life after the Joker kills Lois Lane. Superman returns to exert a forceful hand on human destiny after a new crop of younger, jerkier superpeople start wreaking havoc in increasingly dangerous clashes. When Clark starts imprisoning those who he deems too dangerous in an internment camp, Batman gathers his own army of heroes to take on the inevitable chaos. Bats and Supes’ beef is more of a philosophical one here and it’s one of the smartest distillations of both the commonalities and differences between the two men. Kal-El’s rocket landed in Soviet Russia in this 2003 alternate reality tale, which looks at what happens when the Last Son of Krypton absorbs cultural lessons from somewhere that isn’t the American heartland. The version of Batman who appears here is a Bolshevik-styled rebel who resents the Comrade of Steel’s iron grip over human affairs. The fight here differs from its predecessors because Batman gets an indirect assist from Lex Luthor to help take away Superman’s powers. In most BvS stories, the Man of Steel and the Dark Knight fight one or more battles until they reconcile with each other. But, in the Injustice series, they’ve been fighting a war. Injustice’s alt-reality spun out of a fighting game made by NetherRealm, the same dev studio responsible for Mortal Kombat. Beginning with Clark killing the Joker after the malevolent clown tricked him into killing a pregnant Lois, this continuity features a much gorier and melodramatic take on Bats/Supes throwdowns than seen in most comics. When Clark and Bruce take each other on in this series, the fisticuffs and insults are raw and personal. Alfred gets in on it, too, thanks to super-pills that make normal humans strong enough to hurt Kal-El. In 2004, superstar cartoonist Darwyn Cooke wrote and drew a take on DC’s biggest icons set during the transition from the late ‘50s Eisenhower presidency to the JFK Camelot era. The New Frontier became a well-loved hit and spawned a cinematic adaptation years later. Cooke returned to this milieu when the movie version came out. The 2008 one-shot that features a very fun Bruce vs. Clark fight that was only hinted at in the original comics. It’s got a few strategies that are familiar by this point, but it’s buoyed up by a fresh setting and great scripting. Just like in the new BvS movie, Wonder Woman shows up just in time to stop very bad things from happening. 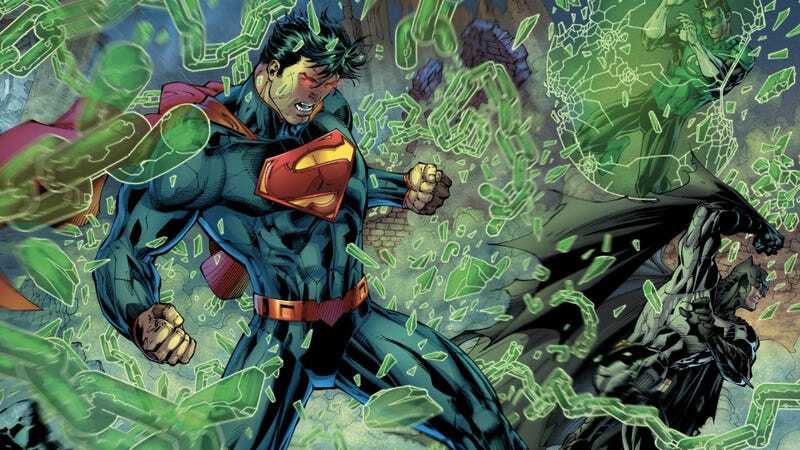 DC Comics reset their universe once again in 2011 with the New 52 reboot. That, of course, gave them a chance to do yet another first-meeting story between their two biggest heroes. This time, the encounter happens in a Justice League comic and shows many of the team’s eventual members’ initial encounters with other super-folk. Physically, it’s more of a Superman/Green Lantern brawl than anything but it wouldn’t have happened without Batman’s surly attitude setting things off. If your favorite Batman vs. Superman story isn’t on here, let us know what is in the comments below.